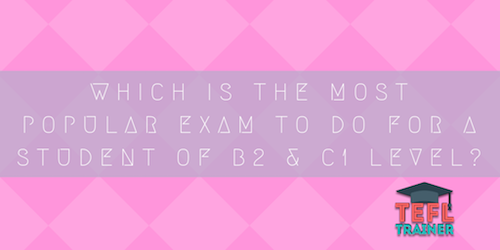 Which is the most popular exam to do for a student of B2 and C1 level? Most companies or universities require different EFL exam certificates. In this essay I am going to talk about the popular exams outside of Spain and which is the most popular for a student with a B2 level of English and with a C1 level of English. EFL exams are exams intended to examine a non- native speaker’s ability in the English language. There is a vast variety of possible options for students when deciding which exam best assesses their level of English. The most popular exam for a B2 student is the FCE exam (first certificate). The first certificate is a very popular exam amongst the students at the academy because they need to apply for foundation and higher education courses taught in English around the world. The FCE is recognized as proof of English language proficiency by thousands of universities, pathway providers and establishments around the world. The FCE exam is not as popular as the other exams taken at the academy. During my time as a TEFL trainer teacher, I have only had a few students preparing for this exam. One particular student likes to do the listening in his own time, and at the academy he likes to concentrate on reading, writing and speaking. During the speaking classes, he likes to divide the class into two – speaking and looking over this writing tasks. This particular student has requested to be taught by me as he feels comfortable and as time has gone by, he is getting more confident and has improved in all areas of English language skills. On the other hand, the most popular exams for a C1 student is the IELTS exam or the CAE exam. The exam which appears to be the most popular between both students and universities is the IELTS (International English Language Testing System). There are numerous reasons for this, and even though it requires a high level of English to attain a good mark, the exam is fairly easy, including tests of speaking, listening, reading and writing. The next most popular exam among my students is undoubtedly the CAE (Cambridge Advanced English), a complex exam held in high regard. The main advantage this certificate has over the IELTS is that it does not expire (which the IELTS does after two years), providing a fountain of opportunity once successfully accomplished. Apart from the four language skills, the CAE exam also includes the Use of English, which the student can regularly find difficult and can often be a challenge for native speakers of English. Regarding the speaking part of the exam, some students find it more difficult because pictures must be discussed whereas the IELTS exam entails a structured conversation. During my time at the academy, the IELTS exam has proven to be the most popular exam to be taken, for a number of reasons: its less academic than the CAE exam, its one of the easiest exams to take and a lot of students want to take this exam due to them moving or travelling abroad. Every student I teach this exam to has a different level of English and like to concentrate on different skills. One student in particular, likes to spend the first 15 minutes looking through his written exam mocks for me to explain any mistakes, then for the rest of the class he likes to concentrate on the speaking part of the exam and the timing as this is a crucial part of the exam. Many students find the CAE exam difficult due to the ‘use of English’ section. Even the most proficient of students find the ‘use of English’ section of the exam extremely challenging. For example, I had one student who has previously lived in London to improve her English and was taking this exam for a job application. Her English was fluent, she was confident when speaking making only minor errors. She always achieved high scores in reading and listening, however when it came down to the ‘use of English’ section she struggled, and she became less confident. With my encouragement and her commitment, she was improving and even though she was nervous as her exam was soon approaching, she continued to practise when she could and came back to the academy to tell everyone that she had passed.